TRUMP: He told the Washington Post: "I. Will. Never. Leave. This. Race." And he told Time Magazine: "If I don’t win, for me, it will have been a total waste of time." The big picture on Trump, via POLITICO: NRCC chairman Rep. Greg Walden goes on the record with POLITICO to say that if Trump is nominated: "It puts, certainly, competitive seats in jeopardy. We’ll have a much more difficult time." And Rep. Steve Stivers said flatly "It would be devastating to our attempts to grow our majority and would cost us seats." 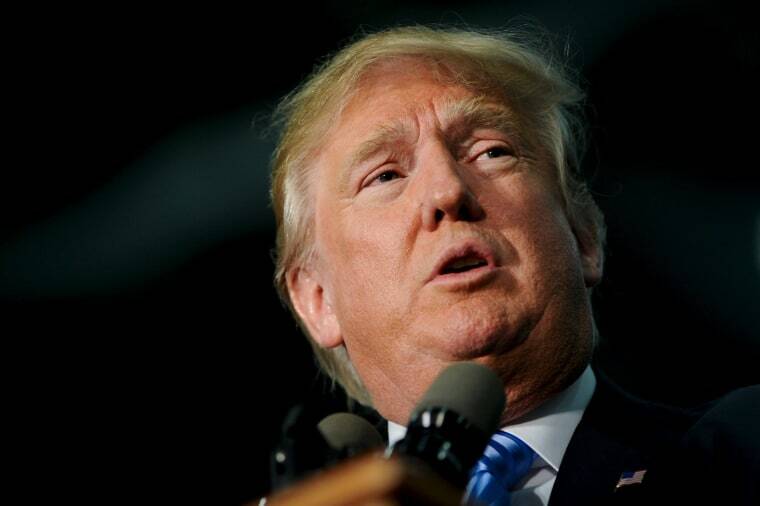 The latest New Hampshire poll shows Trump's lead at 18 points over the nearest competition. Dan Balz in the Washington Post: "Nothing in modern politics equates with the kind of rhetoric now coming from Candidate Trump. There are no perfect analogies. One must scroll back decades for echoes, however imperfect, of what he is saying, from the populist and racially based appeals of then-Alabama Gov. George Wallace in 1968 and 1972 to the anti-Semitic diatribes of the radio preacher Charles Coughlin during the 1930s." The New York Times, on the global Trump effect: "A day after Donald J. Trump called for a ban on the entry of Muslims into the United States, much of the rest of the world looked at the American presidential election on Tuesday with a mix of befuddlement and despair. How is it, many wondered, that the same nation that twice put the black son of a Kenyan in the White House could now be flirting with Mr. Trump and his divisive, exclusionary stances?" Would Trump's plan survive a lawsuit? The New York Times says it's not impossible. From the AP: "Donald Trump's call to keep Muslims from traveling to the United States is causing dismay among business leaders in the Middle East, a region where the billionaire presidential candidate has done business for years, viewed as well-suited for his brand of over-the-top luxury." And there's this too: "A major Middle Eastern retailer has pulled all Trump-branded homeware products after the GOP frontrunner called for Muslims to be barred from entering the United States." BIDEN: He told Bloomberg that he won't endorse in the Democratic primary. CARSON: Reports the Washington Post: "Republican presidential candidate Ben Carson on Tuesday announced a 16-members foreign policy team that “will help Dr. Carson chart a course for renewed American global leadership in the 21st century” — the campaign’s latest attempt to silence critics who have questioned his grasp of national security issues in the wake of the Paris attacks and the shooting in San Bernardino, Calif."
CRUZ: South Carolina's evangelicals are starting to rally around his campaign. RUBIO: Team Rubio is highlighting this NYT story: "A little-noticed health care provision that Senator Marco Rubio of Florida slipped into a giant spending law last year has tangled up the Obama administration, sent tremors through health insurance markets and rattled confidence in the durability of President Obama’s signature health law. So for all the Republican talk about dismantling the Affordable Care Act, one Republican presidential hopeful has actually done something toward achieving that goal." SANDERS: He got irritated with reporters after he was questioned about ISIS Tuesday, NBC's Alex Jaffe reports. Writes the New York Times: "Secretary of State John Kerry said on Wednesday that he would sell an agreement on tackling climate change to the American people almost entirely as a jobs and economic issue." "The FBI’s system for tracking fatal police shootings is a “travesty,” and the agency will replace it by 2017, dramatically expanding the information it gathers on violent police encounters in the United States, a senior FBI official said Tuesday," the Washington Post reports. "The new effort will go beyond tracking fatal shootings and, for the first time, track any incident in which an officer causes serious injury or death to civilians, including through the use of stun guns, pepper spray and even fists and feet." TIME's Person of the Year is: Angela Merkel. The House has overwhelmingly voted to tighten the visa waiver program. Working for the weekend: "Republican leaders in the House and Senate are indicating that this Friday’s deadline for passing a spending agreement will almost certainly slip, with work required through the weekend and perhaps well into next week to wrap things up." Writes the Wall Street Journal: "Mrs. Pelosi, determined to block as many GOP policy measures as she can, is demonstrating to the new speaker that Democrats’ support on must-pass legislation won’t come cheap. As such, she is working to prevent Republicans from securing all but the slimmest of policy victories. The outcome, if these issues aren’t resolved, could be a delay in securing government funding for fiscal year 2016, or, worse, a shutdown." *** Wednesday’s “Andrea Mitchell Reports” line-up: Joining NBC’s Andrea Mitchell today at 12p ET – Philadelphia Mayor Michael Nutter and Rep. Keith Ellison (D-MN) responding to Trump’s comments banning Muslims from entering the U.S.; NAACP Legal Defense Fund’s Sherrilyn Ifill at the Supreme Court following today’s affirmative action case; plus more 2016 politics with the Wall Street Journal’s Carol Lee and the Washington Post’s Chris Cillizza.